A friend made a remark about artistic creativity, and suggested that an artist can be more free working with analog tools compared to digital tools. Many people have ideas about this, without really knowing what it’s like to draw and paint digitally. For me it’s not about deciding if it’s better to paint with real, analog watercolours or digital watercolours – every way to paint or create art has its benefits and way to be creative. To me it’s a matter of what one likes to work with and also, how the result will be used. When I know that a drawing will end up in print or digital publishing for example, then I might as well work digitally from start so that I can control the quality better. But, others have other ways to create drawings and I think part of the creative work is to find working methods that suits you and give you the result you want. 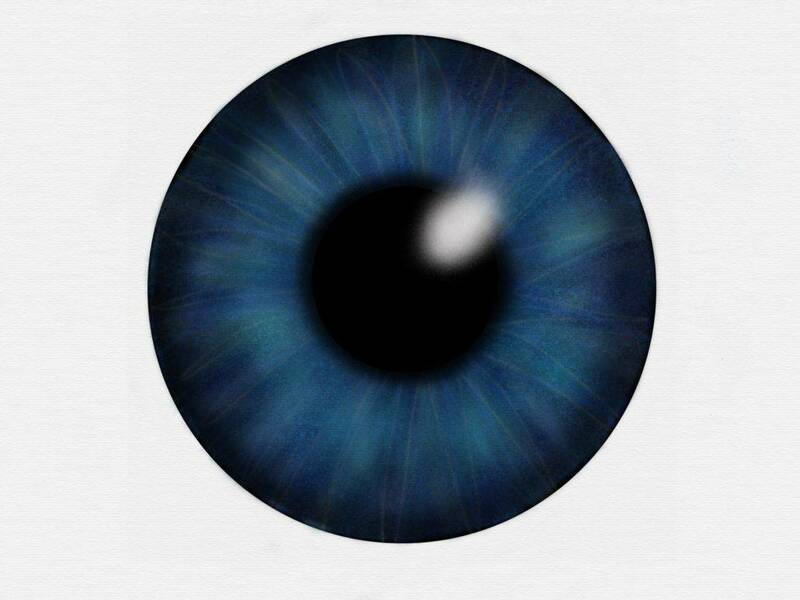 Anyway, I started to paint eyes with the purpose to show how I work digitally, but also with ”digital analog tools”. 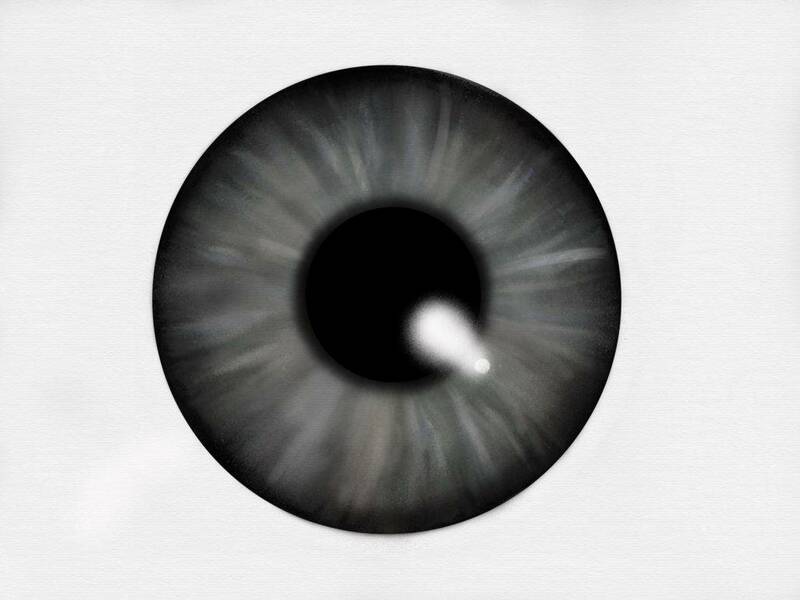 Note: I just painted my inner image of what eyes look like, I didn’t look at any photo. Brown eye, I used any digital tool that I wanted to use and I worked with layers. 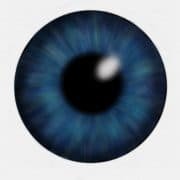 This is the first eye I painted. I used Tayasui Sketches on my iPad Pro. I had no limits to how I could use the digital tools, I used many kinds of brushes, shapes, layers and blending effects. Green Eye, I used ”almost analog digital watercolours”. It was difficult to get an exact shape though, so in the end I just couldn’t stand the imperfection and used a circle shape so that I could erase the edges and get a better circle. 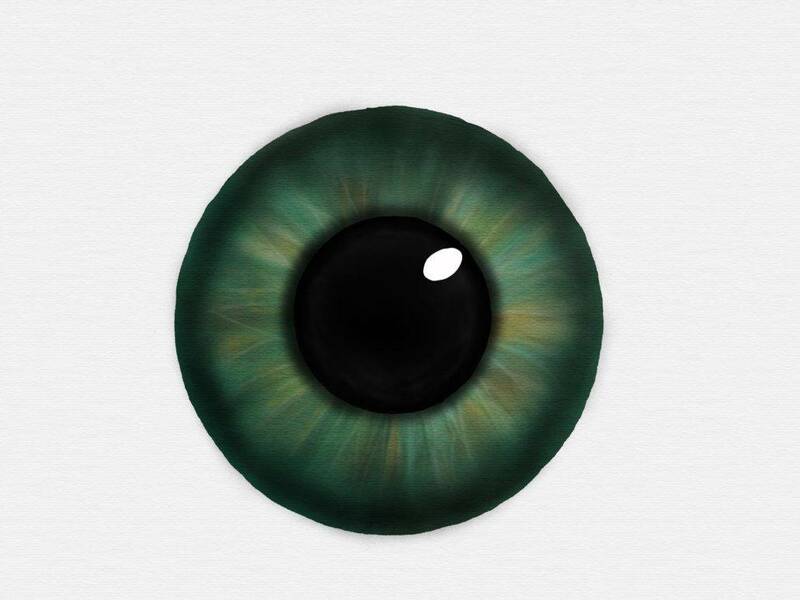 I also added a black circle as a pupil. I really tried to work in an analog way with Tayasui Sketches. I used wet watercolours and let the colours blend as long as the digital paint was ”wet”. Then I added some details on the dry paint. I worked in only one layer. 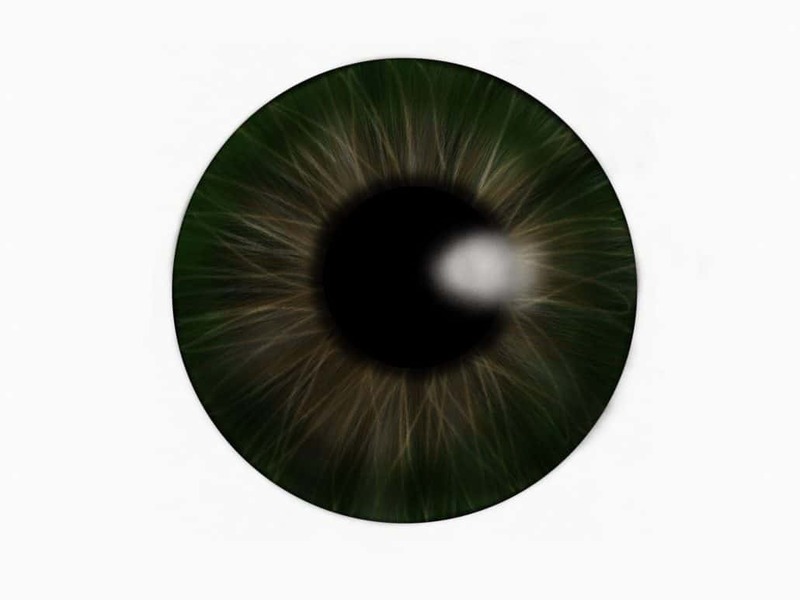 But, it was really difficult to get the pupil black enough and I couldn’t stand that the shape of the eye wasn’t a circle, so I gave up my ambitions and used a circle shape so that I could erase the edges until the eye became a circle and I added a black circle as the pupil. And yes that means that I added layer to this otherwise ”analog digital painting”. Blue Eye, I used digital airbrush, shapes and layers. I just couldn’t help myself, once I started to paint eyes, I had to do one more… This one is made in Tayasui Sketches using the digital airbrush tools, shapes and layers. I told myself that I shouldn’t paint more eyes, but then I got the idea to try to do it in ArtSet. ArtSet is digital of course, but it is so analog that it’s almost annoying. No layers. You can’t change the size of the brushes, except for the oil paint – there you get a set of brushes and can choose how thick you want the paint to be. The tools for blending the paint are a bit clumsy to use. I really tried hard to paint this eye, but in the end I couldn’t stand the imperfect shape and also, the paint looked smudgy and flat. So, again, I decided to open the image in Tayasui Sketches, work on the shape and also use airbrush to soften the smudgy paint, add a black shape as the pupil and of course, to do all this I used layers. So, would it be more creative to use analog tools? I did think the thought of painting an eye with real, analog watercolours, but, just the thought of it makes me feel trapped into something that I don’t like. I am a digital girl (eh, woman, I am 55 actually) and digital tools feel more easy and natural for me to use. I think that every artist can release their creativity best with the tools they prefer to use. Simple as that. 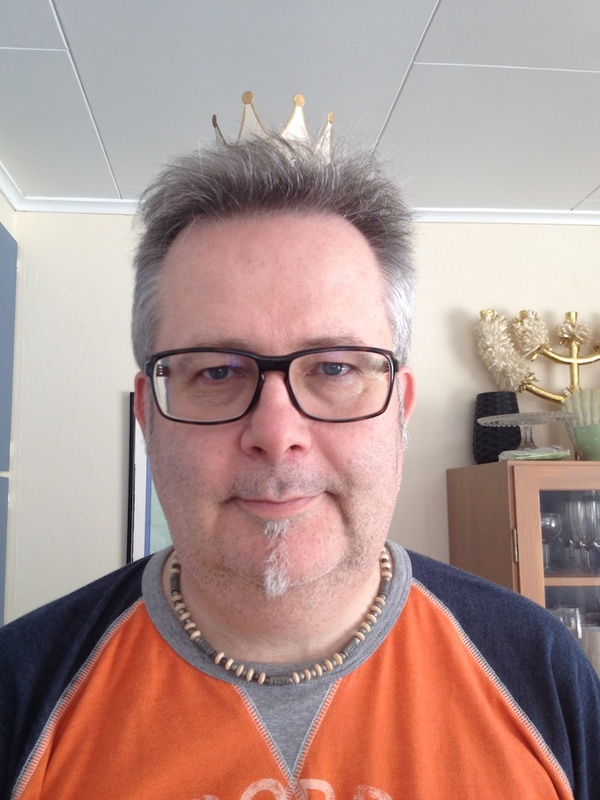 http://www.asastenstrom.se/middleof/wp-content/uploads/sites/4/2017/04/Eye5.jpg 2048 2732 Åsa http://www.asastenstrom.se/middleof/wp-content/uploads/sites/4/2015/03/asainthemiddle1.png Åsa2017-04-30 10:59:592018-05-02 13:03:44Analog or digital creativity? I think one of the nicest thing with my iPad is that I also have a Wacom Bamboo Stylus Solo so that I can draw on it. There are two situations when I want to draw or paint. When I sketch ideas. Like ideas for projects, books, speeches etc. When I want to create and paint. Obviously those are different situations. When I sketch ideas it can be good to not have so many choices. When I create I really need a lot of choices. Both of the situations requires tools with an easy UI (User Interface) so that I don’t get frustrated but find what I need to find and understand what I need to understand quite easy. 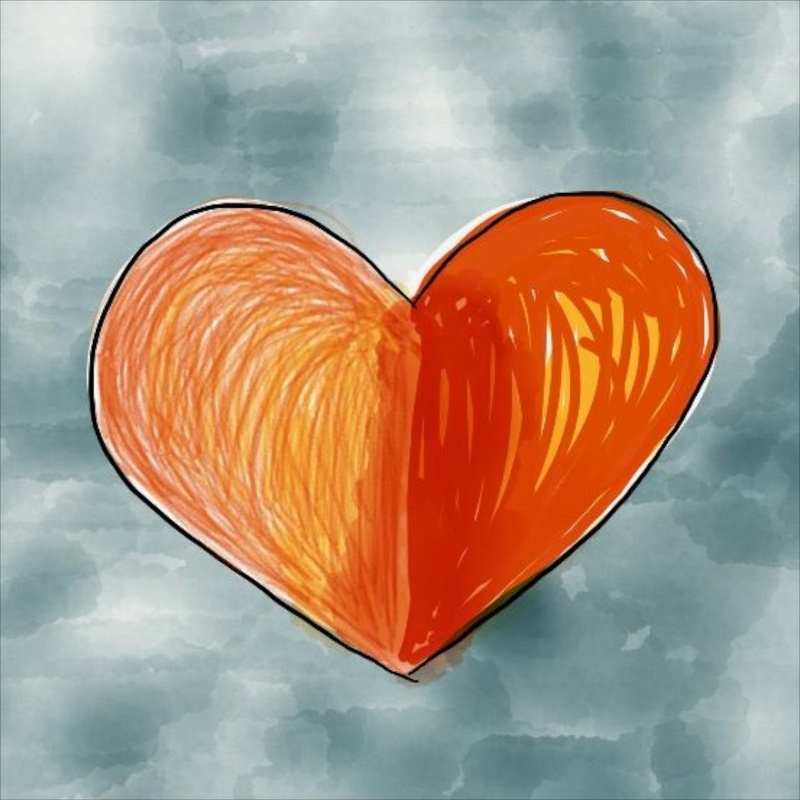 In this test two apps disqualified immediately because of their UI: SketchBook Pro and Auryn Ink. Escpecially SketchBook Pro has been praised and I expected that app to be really competent but every time I try to use it I get annoyed. The UI doesn’t come natural to me. I give up. Auryn Ink was fun when I first got my iPad and I thought it was nice to be able to paint with watercolor. Though, I always expected that I would find out more about how to use it, to understand all the buttons and settings. But I didn’t. I have used Painter since 1993 or 1994, I’m not sure exactly when I started but I know that back then it was called Fractal Painter and nowadays it’s Corel Painter. I also used a Wacom Pen since about that time. That means I have very high standards from what I expect from the ability to draw and paint on an iPad. I think that a lot of people have never tried to use a pen like they now can do on their iPad and part of their joy when they draw on their iPads is because it’s so fun to be able to do it. They are easy to please because they don’t have so much expectations. 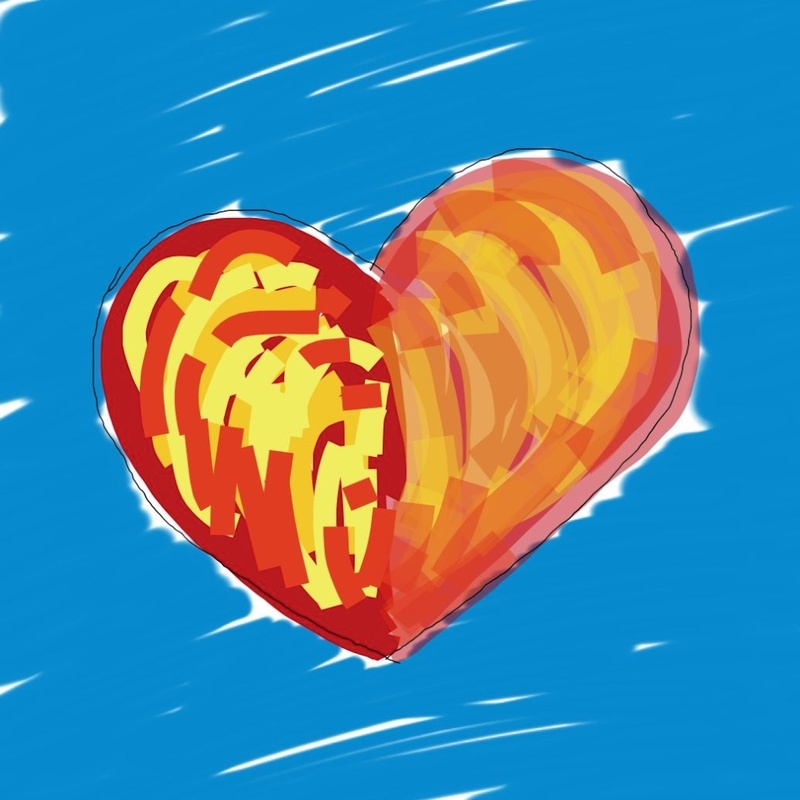 Today I have tested to create a red heart on a blue-grey background in seven different apps. 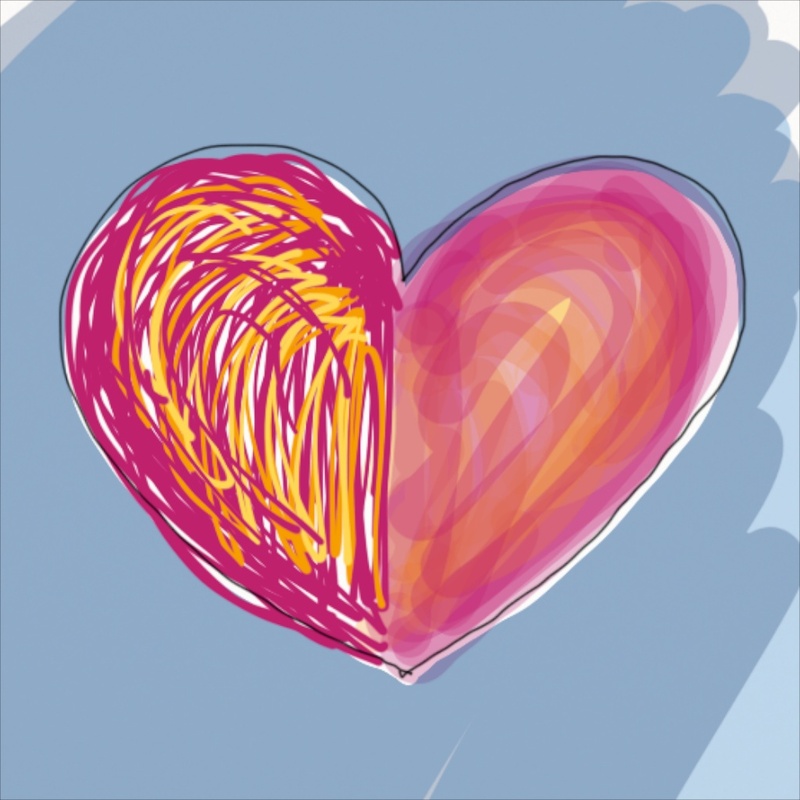 I have tried to use chalk-like tools for half of the heart and covering-tools for the other half. I have also tried to blend the colors from the halves in the middle. Then I have drawn a thin black line around it. These are the result from my test. The apps that I think are the best will come in the end. I begin with the ones that I don’t find so useful. Muji Notes. When I first got my iPad in December 2009 I got happy when I found Muji Notes. I liked that I could both write with the keyboard and sketch. If you want to do simple sketches it stills works pretty nice and I like the possibility to get an overview of all the pages and being able to change the order. But remember: this is a notebook. 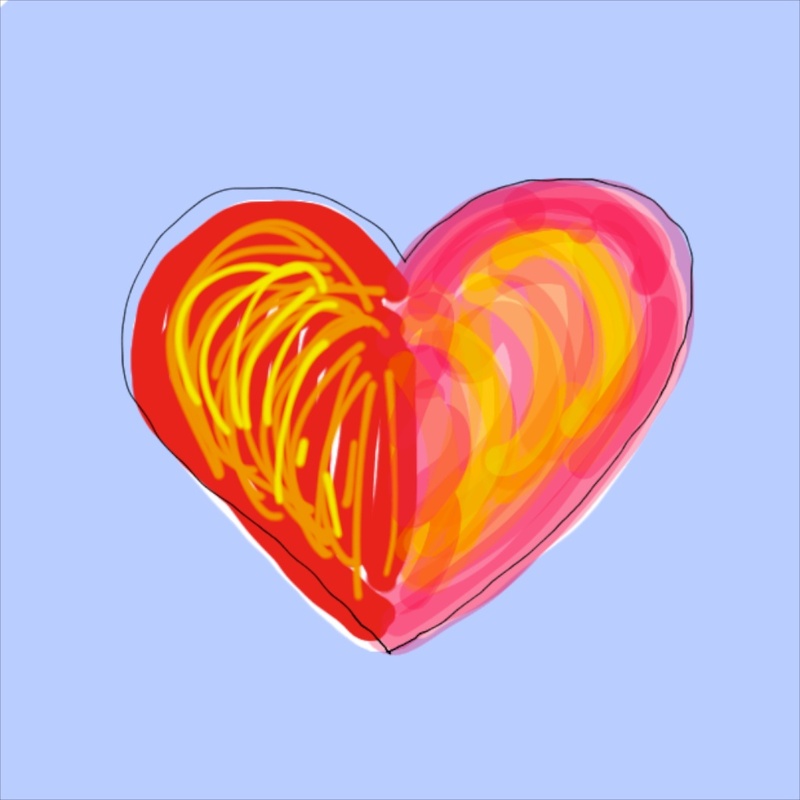 When I tried to paint the heart in Muji it was a hard test on the capacity – the app almost stopped. So, you can use Muji Notes for sketching, but you better not cover the whole page with paint like I did. Sadly, the tools doesn’t work well. The UI is a bit confusing and the pen is not as precise as I expect it to be. As you can see the colors were not so easy to choose. I could have out more time into it – but the small square that one pick the colors from is just too small for my patience. My advice is: don’t use Muji Notes. There are better options. Paper. People seems to be stunned about this app, but I don’t like it. I tried to make a blue-grey background with the watercolor, but the result is clumpsy. I want watercolor to be smooth and wet so that the strokes blends. In fact, you can’t blend any colors in Paper, which is a shame since the color set is so limited with just 9 colors to choose from. If there are other ways to get more colors – then I haven’t found it and then I think it’s to blame on the UI. I think people fall in love with this app because the way you can open your sketchbook and ”run-through the pages with your fingers” is lovely! It really is. And the ink tool also makes lovely lines. But that’s about it. Otherwise I can’t find any use for Paper. I don’t know if I should call it a notebook or a paint tool – but I think it doesn’t really work for any of these categories. I also got very annoyed when I downloaded the app. To start with it was free – but once I opened it I found out that I only could use the ink tool. If I wanted the rest of the tools I had to pay for each of them. I think they are fooling people to believe that they get an app for free and then they have to pay more from start… Not nice! My advice is: you can enjoy Paper by looking at the videoclip on their homepage, but to actually use it is not enjoyable. Don’t download it! Bamboo Paper. Well, this is another note book. Limited colors. Limited use. I think Wacom is the best when it comes to create digital pens – but I don’t think they need to do notebooks-apps as well. Sketch Club. 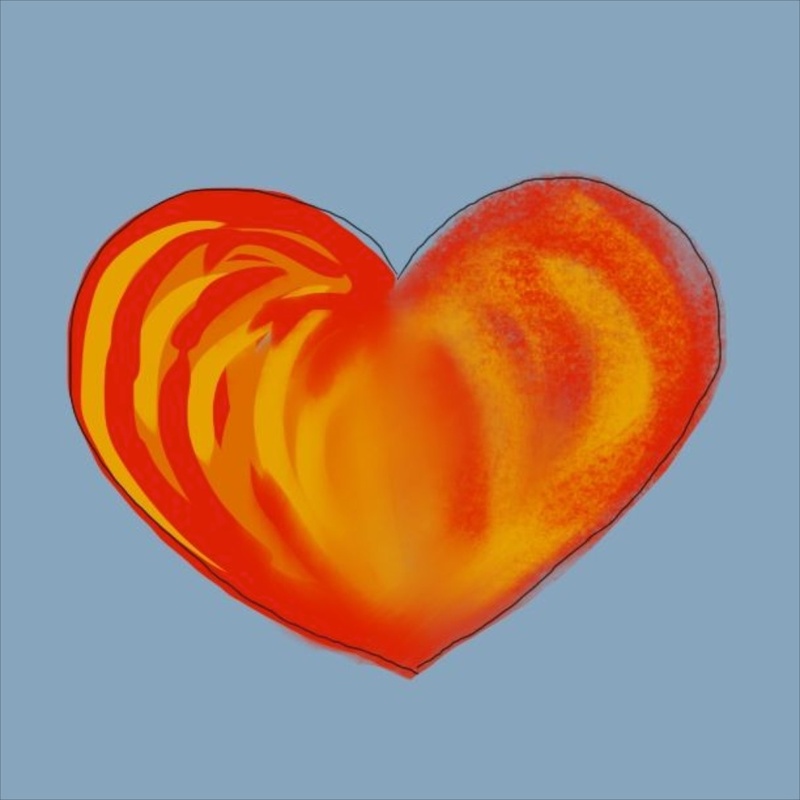 Now, this is an app you can draw and paint with! 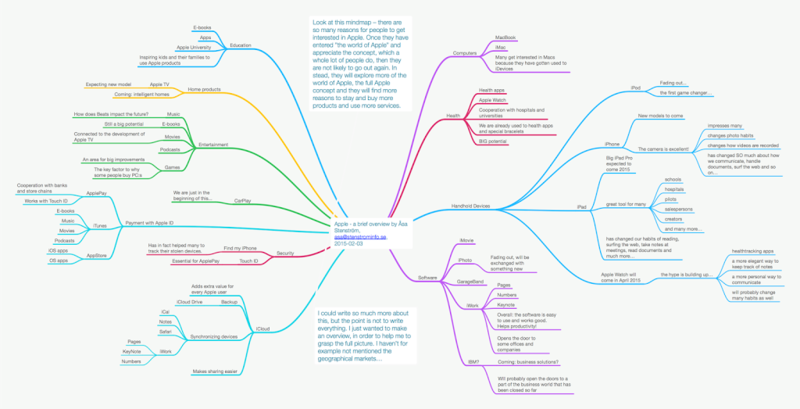 To start with the UI confused me, but once I understood it I think Sketch Club might be useful. As you can see I have used both chalk and coverings pens. It’s possible to smudge the colors but I don’t like that the colors gets dirty. It’s also possible to work with layers. My advice is: close, but no cigar! ArtSet. I like this app! I like that I can work with chalks, oil, pens and other tools and that there a several ways to blend the colors like water, sponge or a clot of paper. But, those blending techniques are not as good as I expect them to be. I also wish they had a covering ink to choose from. 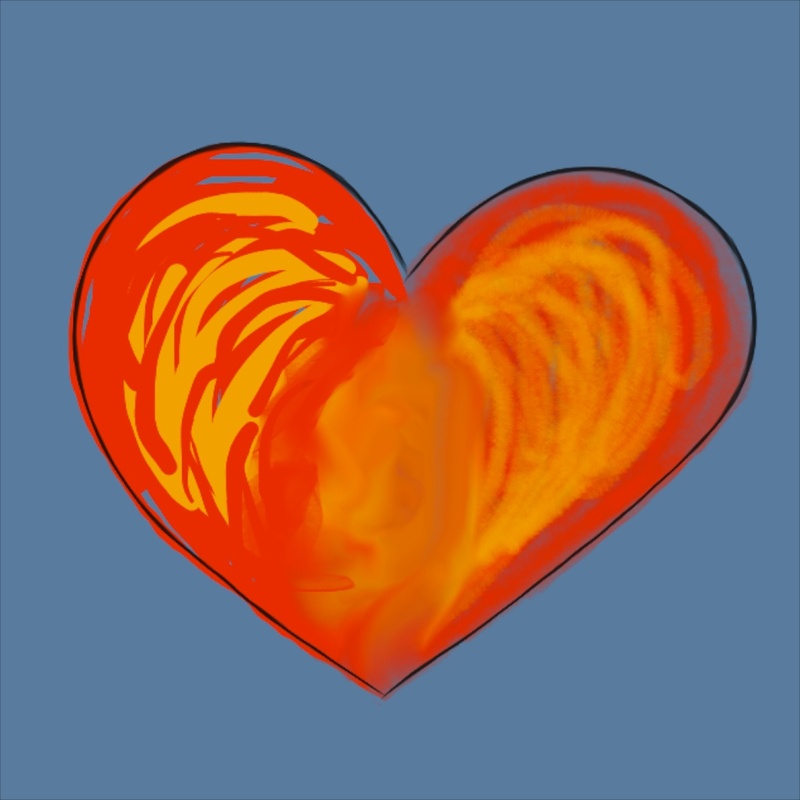 But even so, for a long time I preferred this app when I wanted to paint and create. My advice is: Buy it if you want a cheap app. You can do plenty with it – but it has some limitations. Noteshelf. This is a notebook in which you can both draw with a pen and write with the keyboard. It has a limited choice of colors and only two tools, but you can choose the size of the pens freely. I think it’s really easy to use and it’s fun to sketch ideas in this app. I create a notebook for each project and I have bought some extra covers and papers for fun – but you get as much as you need from start. I also like that I can protect some of the notebooks with password and it’s handy that I can export my sketches to Evernote and then copy Evernote’s url and send to someone I want to look at my sketches. My advice is: Get Noteshelf! It’s the best notebook app I have. It’s easy to use and have practical functions. You will not be able to draw fantastic paintings with it – but it will help you to visualize your ideas. ProCreate! Taraaa, here it comes, the winner in my paint app test. I bought it yesterday and I am happy. At last an iPad app that works with elegance. The UI is really easy. As you can see the chalk and the covering ink works fine and so does the blending. I also like the thin black line. I have used layers as well. This is just my drawing I did for this test. If you look at it closely you can see the structure of the paint. 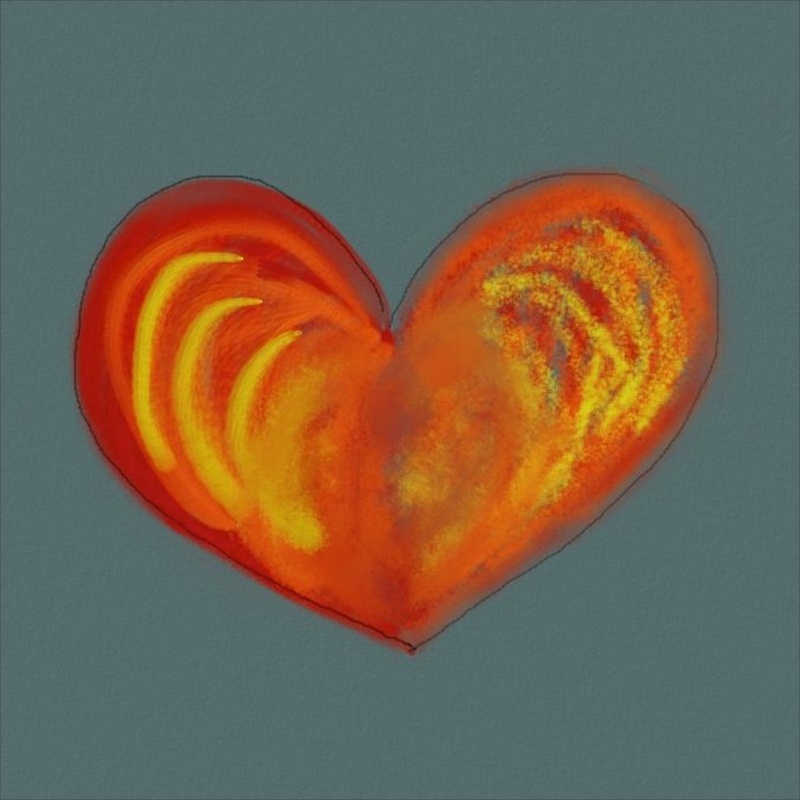 My advice is: If you like to paint – then buy ProCreate. 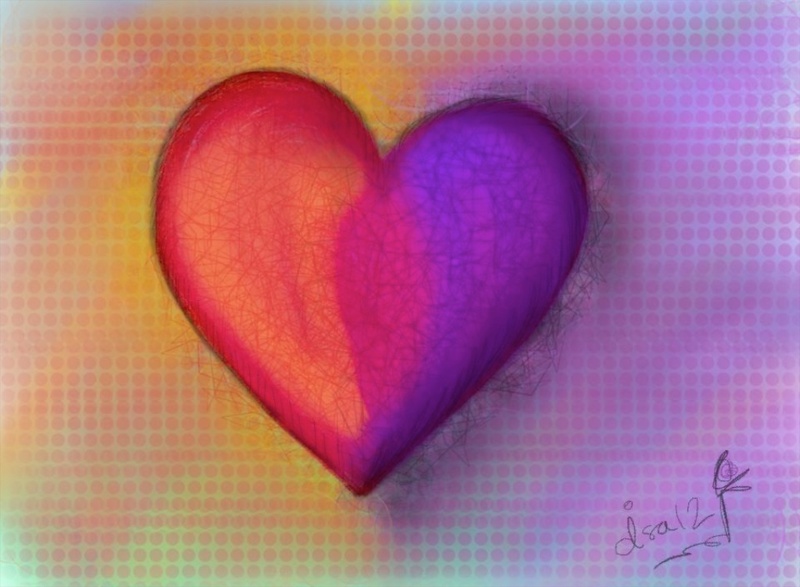 I end this blogpost with the first picture I painted with ProCreate yesterday. I hope you liked my test! If you click on a picture you can watch them all as a slideshow.